Not to be confused with Langerhans cells, found in the epidermis. 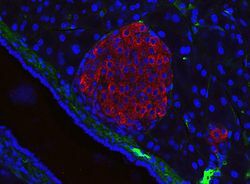 A pancreatic islet from a mouse in a typical position, close to a blood vessel; insulin in red, nuclei in blue. It has been recognized that the cytoarchitecture of pancreatic islets differs between species. In particular, while rodent islets are characterized by a predominant proportion of insulin-producing beta cells in the core of the cluster and by scarce alpha, delta and PP cells in the periphery, human islets display alpha and beta cells in close relationship with each other throughout the cluster. Islets can influence each other through paracrine and autocrine communication, and beta cells are coupled electrically to six to seven other beta cells (but not to other cell types). A pancreatic islet, showing beta cells. A large number of G protein-coupled receptors (GPCRs) regulate the secretion of insulin, glucagon and somatostatin from pancreatic islets, and some of these GPCRs are the targets of drugs used to treat type-2 diabetes (ref GLP-1 receptor agonists, DPPIV inhibitors). Electrical activity of pancreatic islets has been studied using patch clamp techniques. It has turned out that the behavior of cells in intact islets differs significantly from the behavior of dispersed cells. The beta cells of the pancreatic islets secrete insulin, and so play a significant role in diabetes. It is thought that they are destroyed by immune assaults. However, there are also indications that beta cells have not been destroyed but have only become non-functional. 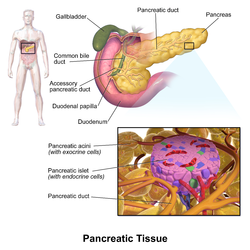 Because the beta cells in the pancreatic islets are selectively destroyed by an autoimmune process in type 1 diabetes, clinicians and researchers are actively pursuing islet transplantation as a means of restoring physiological beta cell function, which would offer an alternative to a complete pancreas transplant or artificial pancreas. Islet transplantation emerged as a viable option for the treatment of insulin requiring diabetes in the early 1970s with steady progress over the last three decades. Recent clinical trials have shown that insulin independence and improved metabolic control can be reproducibly obtained after transplantation of cadaveric donor islets into patients with unstable type 1 diabetes. Islet transplantation for type 1 diabetes currently requires potent immunosuppression to prevent host rejection of donor islets. An alternative source of beta cells, such insulin-producing cells derived from adult stem cells or progenitor cells would contribute to overcoming the shortage of donor organs for transplantation. The field of regenerative medicine is rapidly evolving and offers great hope for the nearest future. However, type 1 diabetes is the result of the autoimmune destruction of beta cells in the pancreas. Therefore, an effective cure will require a sequential, integrated approach that combines adequate and safe immune interventions with beta cell regenerative approaches. It has also been demonstrated that alpha cells can spontaneously switch fate and transdifferentiate into beta cells in both healthy and diabetic human and mouse pancreatic islets, a possible future source for beta cell regeneration. In fact, it has been found that islet morphology and endocrine differentiation are directly related. Endocrine progenitor cells differentiate by migrating in cohesion and forming bud-like islet precursors, or "peninsulas", in which alpha cells constitute the peninsular outer layer and beta cells form later beneath them. Pancreatic islets, the lighter tissue among the darker, acinar pancreatic tissue, hemalum-eosin stain. Illustration of dog pancreas. 250x. Structural differences between rat islets (top) and humans islets (bottom) as well as the ventral part (left) and the dorsal part (right) of the pancreas. Different cell types are colour-coded. Rodent islets, unlike the human ones, show the characteristic insulin core. ^ Elayat AA; el-Naggar MM; Tahir M; Bassam dahrouj (1995). "An immunocytochemical and morphometric study of the rat pancreatic islets". Journal of Anatomy. 186. (Pt 3) (Pt 3): 629–37. PMC 1167020. PMID 7559135. ^ a b Brissova M, Fowler MJ, Nicholson WE, Chu A, Hirshberg B, Harlan DM, Powers AC (2005). "Assessment of human pancreatic islet architecture and composition by laser scanning confocal microscopy". Journal of Histochemistry and Cytochemistry. 53 (9): 1087–97. doi:10.1369/jhc.5C6684.2005. PMID 15923354. ^ Ichii H, Inverardi L, Pileggi A, Molano RD, Cabrera O, Caicedo A, Messinger S, Kuroda Y, Berggren PO, Ricordi C (2005). "A novel method for the assessment of cellular composition and beta-cell viability in human islet preparations". American Journal of Transplantation. 5 (7): 1635–45. CiteSeerX 10.1.1.578.5893. doi:10.1111/j.1600-6143.2005.00913.x. PMID 15943621. ^ a b Cabrera O, Berman DM, Kenyon NS, Ricordi C, Berggren PO, Caicedo A (2006). "The unique cytoarchitecture of human pancreatic islets has implications for islet cell function". Proceedings of the National Academy of Sciences of the United States of America. 103 (7): 2334–9. Bibcode:2006PNAS..103.2334C. doi:10.1073/pnas.0510790103. ISSN 1091-6490. PMC 1413730. PMID 16461897. ^ Kelly, Catriona; McClenaghan, Neville H.; Flatt, Peter R. (2011). "Role of islet structure and cellular interactions in the control of insulin secretion". Islets. 3 (2): 41–47. doi:10.4161/isl.3.2.14805. ^ Wang, Michael B.; Bullock, John; Boyle, Joseph R. (2001). Physiology. Hagerstown, MD: Lippincott Williams & Wilkins. p. 391. ISBN 978-0-683-30603-3. ^ Pérez-Armendariz M, Roy C, Spray DC, Bennett MV (1991). "Biophysical properties of gap junctions between freshly dispersed pairs of mouse pancreatic beta cells". Biophysical Journal. 59 (1): 76–92. Bibcode:1991BpJ....59...76P. doi:10.1016/S0006-3495(91)82200-7. PMC 1281120. PMID 2015391. ^ Meloche RM (2007). "Transplantation for the treatment of type 1 diabetes". World Journal of Gastroenterology. 13 (47): 6347–55. doi:10.3748/wjg.13.6347. PMC 4205453. PMID 18081223. ^ a b Hogan A, Pileggi A, Ricordi C (2008). "Transplantation: current developments and future directions; the future of clinical islet transplantation as a cure for diabetes". Frontiers in Bioscience. 13 (13): 1192–205. doi:10.2741/2755. PMID 17981623. ^ Piemonti L, Pileggi A (2013). "25 Years of the Ricordi Automated Method for Islet Isolation". CellR4. 1 (1): 8–22. ^ Chatenoud L (2008). "Chemical immunosuppression in islet transplantation—friend or foe?". New England Journal of Medicine. 358 (11): 1192–3. doi:10.1056/NEJMcibr0708067. ISSN 0028-4793. PMID 18337609. ^ Pileggi A, Cobianchi L, Inverardi L, Ricordi C (2006). "Overcoming the challenges now limiting islet transplantation: a sequential, integrated approach". Annals of the New York Academy of Sciences. 1079 (1): 383–98. Bibcode:2006NYASA1079..383P. doi:10.1196/annals.1375.059. ISSN 0077-8923. PMID 17130583. ^ van der Meulen, T.; Mawla, A.M.; DiGruccio, M.R. ; Adams, M.W. ; Nies, V.; Dolleman, S.; Liu, S.; Ackermann, A.M.; Caceres, E.; Hunter, A.E. ; Kaestner, K.H. ; Donaldson, C.J. ; Huising, M.O. (2017). "Virgin Beta Cells Persist throughout Life at a Neogenic Niche within Pancreatic Islets". Cell Metabolism. 25 (4): 911–926. doi:10.1016/j.cmet.2017.03.017. PMID 28380380. ^ Sharon, N.; Chawla, R.; Mueller, J.; Vanderhooft, J.; Whitehorn, L.J. ; Rosenthal, B.; Gürtler, M.; Estanboulieh, R.R. ; Shvartsman, D.; Gifford, D.K. ; Trapnell, C.; Melton, D. (2019). "A Peninsular Structure Coordinates Asynchronous Differentiation with Morphogenesis to Generate Pancreatic Islets". Cell. doi:10.1016/j.cell.2018.12.003. ISSN 0092-8674. PMID 30661759.